England defender Phil Jones stepped up his involvement in training on Tuesday at St George's Park as he continues his recovery from a shoulder injury. The Manchester United player suffered the injury against Hull on 6 May, but was named in England's World Cup squad. Jones, 22, was restricted to light training in Portugal last week, but has taken part in ball work. Midfielder James Milner was the only squad member unable to train after he came down with a cold. Full-back Leighton Baines was also absent because of a family commitment, with the Everton player expected to return on Tuesday evening. As in Portugal, England's players wore extra layers for training to up their body temperatures ahead of the Group D opener against Italy in Manaus on 14 June. Jones, who has yet to take part in full-contact training, would be replaced by uncapped Everton defender John Stones if he is unable to prove his fitness by 2 June. 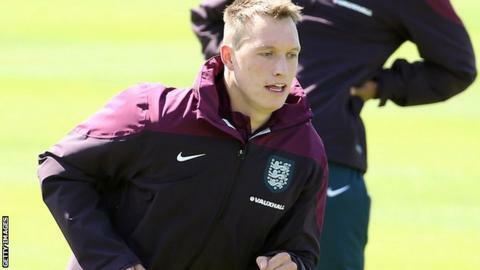 But manager Roy Hodgson has said he expects Jones to be able to play a full part in England's campaign in Brazil. Stones is one of seven players placed on standby by Hodgson and has been taking part in training sessions in Portugal and St George's Park.